“Leaves, flowers, fruit, roots, branches and the main stem – everything about tulsi is sacred; even the soil under the tulsi plant is holy.” excerpt from the Padmapurana, an acnient healing text from India. 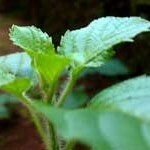 “The Queen of Herbs” is the most sacred herb in India. Tulsi (Ocimum sanctum), also known as Holy Basil, is a different plant from the pesto variety, and has been revered in India for 5,000 years as a healing balm for body, mind and spirit, known to bestow an amazing number of health benefits. Tulsi is rich in antioxidants and renowned for its restorative powers, some of its benefits include relieving stress, building the immune system, enhancing stamina, keeping colds away and promoting a healthy metabolism. The unique chemistry of tulsi is highly complex, containing hundreds of beneficial compounds known as phyto-chemicals. Working together, these compounds possess strong antioxidant, antibacterial, antiviral, adaptogenic, and immune-enhancing properties that promote general health and support the body’s natural defence against stress and disease. The essential oils in the leaves that contribute to the fragrance and refreshing flavor of tulsi tea, are a particularly rich source of valuable phyto-chemicals. This entry was posted in Healthy Living and tagged supplements. Bookmark the permalink.